The Century Building, on Broadway and 17th Street. Broadway in the 1890s was said to have a "champagne sparkle." "All the world came to to Broadway to shop, to dine, to flirt, to find amusement, and to meet acquaintances," wrote Henry Collins Brown, curator of the Museum of the City of New York. Born in 1862, Brown probably spoke from personal experience. Today many New Yorkers remember the dazzle of Ladies Mile from Jack Finney's time-capsule novel Time and Again. "Suddenly I had to close my eyes because actual tears were smarting at the very nearly uncontainable thrill of being here. The Ladies' Mile was great, the sidewalks and entrances of the block after block of big glittering ladies' stores. 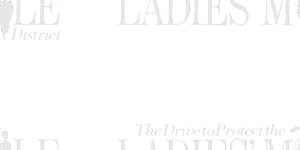 . ."
Serious musicians and music lovers mingled with elegantly dressed ladies at 18th Street and Broadway, where the Charles Ditson Co. was located in the red-brick building that is today the paragon store. Ditson's founders were considered daring for publishing Beethoven and Mendelssohn earlier in the century. Across from Ditson's you would have seen Errico Brothers at 862 Broadway, who advertised their Florentine carved furniture in Vogue. 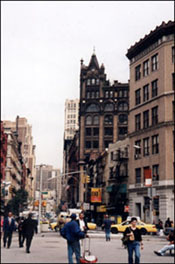 Broadway and 17th Street, looking north. The Bank of the Metropolis (left), 31 Union Square West. 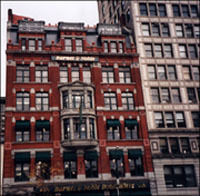 The Union (or Decker) Building (right), 33 Union Square West. The Romanesque Revival skyscraper with the extraordinary attic on the northeast corner of 18th Street is the McIntyre Building by R. H. Robertson, 1890. Montgomery Schuyler was an admirer of Robertson's work, which he described as "unscrupulously picturesque." He called the McIntyre "one of the most effective bits of our street architecture. . . with the long colonnaded attic and the picturesque corner tower. 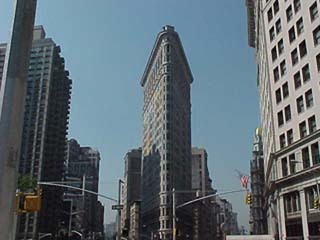 . ."
A side view of the Flatiron Building. 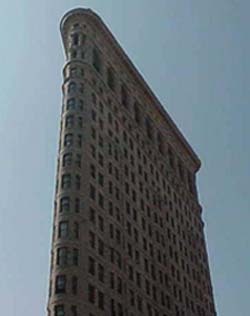 When D. H. Burnham's Flatiron Building was completed in 1902, it was reviewed in Architectural Record as "quite the most notorious thing in New York and attracts more attention than all the other buildings now going up together . . . We have to congratulate the architect on the success of his detail. . . of giving appropriate texture to his walls . . . The manufacturer has managed exactly to match the warm yellow-gray of the limestone base in the tint of the terra cotta above." 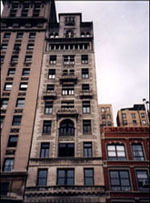 Exquisite terra cotta ornament is one of the important characteristics of the architecture of Ladies' Mile, and Burnham's use of it helped his skyscraper to fit harmoniously into a vista of lower buildings. The Flatiron Building, Fifth Avenue and 23rd Street.